Chicago DJ Equipment Online Superstore - PRO TOOLS SOFTWARE AT THE LOWEST PRICES! The most powerful digital audio workstation just got more powerful. Pro Tools redefines professional music and audio production for today’s workflows. From all-new audio and video engines and turbocharged "64-bit" performance, to expanded metering and new HD video workflows, Pro Tools enables you to take on the most demanding sessions and maximize your creativity—without holding anything back. With the fully optimized Avid Audio Engine , you get multiple times the processing power of Pro Tools 10 on the same hardware configurations. So go ahead—pile on epic numbers of virtual instruments and effects to create richer sounding, more complex mixes and experience performance like never before with the most powerful audio workstation available. Wait no longer... With faster-than-real-time offline bounce , you can speed up your final mix or stem deliveries—at up to 150x faster—and get the high-quality results you’d expect only from Pro Tools, thanks to time-stamped automation. If you mix and deliver radio programs or other long-format shows, this feature alone will save you hours of time—daily. 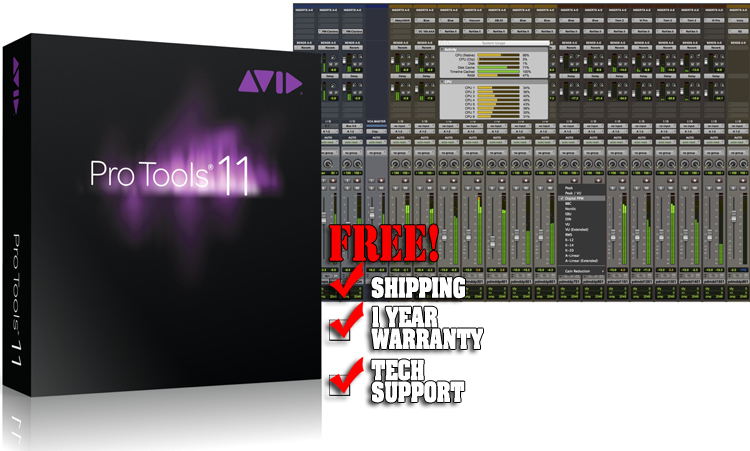 And with Pro Tools HD 11, you can even bounce multiple stems simultaneously. With dedicated low-latency input and playback buffers , you can monitor record inputs on native systems with ultra-low latency—without sacrificing plug-in performance. Even with large, plug-in-heavy sessions, you get the responsiveness you need to record your best performance. Forget having to invest in additional plug-ins to get K-system, VU, and other professional metering standards. You now have 17 metering options built right into the interface , enabling you to optimize your mix while adhering to regional broadcast audio regulations. What’s more, you also get gain reduction metering on every channel to gauge dynamics. With the enhanced disk handler, you'll experience great recording and playback responsiveness. Keep your creativity flowing—even when working on a laptop with an external drive or a network-attached storage device. With Pro Tools, you have the flexibility to record, edit, and mix music and sound for picture your way. Use multiple audio formats and bit depths in the same session. Pair the software with your favorite Avid or third-party audio interface to record and monitor vocal and instrument performances. Or record and create with just your computer** and the software alone for ultimate portability. Polish mixes with over 70 included effects, sound-processing and utility plug-ins. From high-quality reverbs, EQs, and compressors, to guitar amp emulators, surround sound fold-down, and channel strip dynamics, you have everything you need to create professional mixes. Want more? Browse the in-app Avid Marketplace to find the AAX plug-ins you need. You can use a mouse to make changes one… at… a… time, or mix faster and easier using a hardware control surface. Get hands-on Pro Tools control with a choice of Avid control surfaces and consoles and third-party boards. Whether you've got a work in progress or a finished piece, Pro Tools makes it easy to share. With Gobbler integration, you can send full sessions and mixes to other collaborators fast, and securely back up and sync sessions in the cloud—Gobbler automatically backs up as you go. With direct SoundCloud support, you can share files privately with other collaborators, or share finished projects with the world. And bounce mixes to your iTunes library to share with others on your network.